Doctors who serve diverse communities often face the challenge of communicating effectively with patients who don’t share their language. 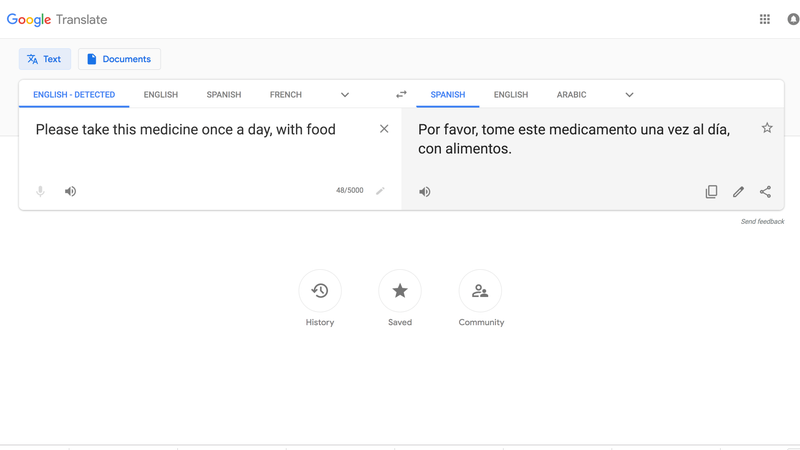 Some doctors are bridging this gap with help from Google Translate, an AI-driven app that has become increasingly sophisticated in recent years. But while a new study from California shows that the app can definitely help non-English speaking patients and their doctors, it isn’t flawless—rarely, the translations could even cause harm. Previous studies of Google Translate and other translation tools in helping decipher medical information for non-English speakers had found mixed results. One study cited by the authors, for instance, found an accuracy rate of 60 percent for patient pamphlets translated to Spanish. But in 2017, Google updated its translation algorithm, claiming that it would substantially increase accuracy. To test this out, researchers at the University of California, San Francisco sent a set of 100 medical instructions through the new version of the app. The instructions were lifted from those given by real emergency department doctors to patients and were translated into both Spanish and Chinese. The results, published in JAMA Internal Medicine on Monday, were much more impressive this time around. Overall, 92 percent of instructions translated into Spanish were accurate, as well as 81 percent of instructions translated into Chinese. That said, there was the occasional garbled instruction. Usually, these were just confusing, relatively harmless translations, often caused by a doctor’s use of long, run-on sentences or medical lingo. But more rarely, there were translated instructions that would have been potentially dangerous for patients to carry out. These sorts of harmful interpretations only happened 2 percent of the time among all Spanish mistranslations, and 8 percent of the time with Chinese mistranslations. And the authors say that they shouldn’t invalidate the net positives of using Google Translate. But there are practical steps doctors could take to prevent the worst from happening, they added. These include sticking to simple, short sentences, using Google Translate in conjunction with a human translator (whether in-person, via the phone, or over video), and writing down instructions in both English and the translated language, so that an English-speaking relative or friend can later go over both and make sure there are no major translation fails.